Head over to Cuties Juice on Facebook to print a coupon for a FREE 8 oz. Cuties Juice or Smoothie. Just scroll down past the picture until you see the post from Cuties, then click on the link in the post to print the coupon. 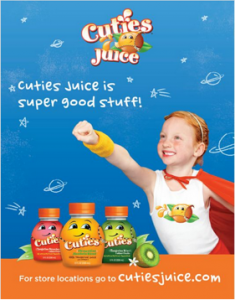 To find a store that carries Cuties Juice near you, click here. They can be found at Super Target and Harmons.